Comedian and Full Frontal writer Ashley Nicole Black told the inspiring story of how Nichelle Nichols “integrated space” for Drunk History on Tuesday night. Black does a truly amazing job, and as a bonus, seems like the kind of drunk person who could convince you to go to another bar at 2 a.m. even though you’re broke and your feet hurt. 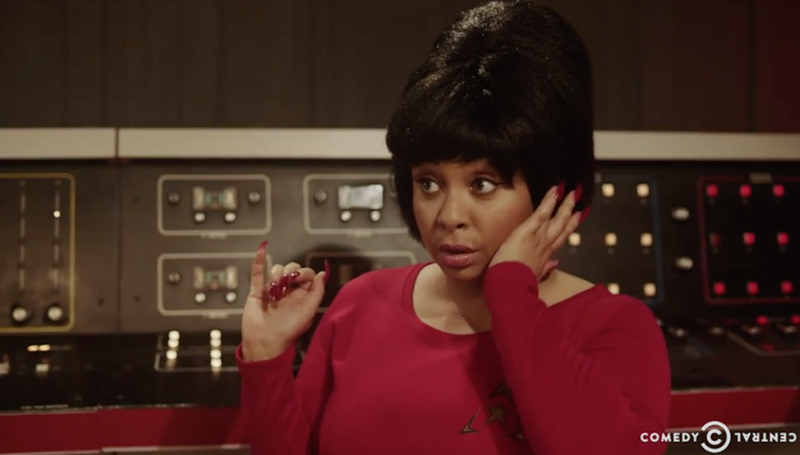 Nichols, played by Raven-Symoné, apparently didn’t know how influential her Star Trek character, Uhura, was on the American viewing public, according to Black. Even though she was on it, she didn’t watch the show, and what she really wanted to be doing was sing and dance, not pretending to press buttons. She quit, but creator Gene Roddenberry begged her to give it the weekend. And what a weekend. At a NAACP event, Nichols was introduced to a big Trekkie nerd—Martin Luther King Jr., played here by Jaleel White. MLK Jr. convinces her to stay with the show, because she’s the only black woman on TV who doesn’t play a servant, providing “hope for the future” for viewers, like his own children. Black says Nichols was convinced by MLK’s complete lack of chill and returned to the series. Black then dives into the very famous first onscreen interracial kiss between Nichols and William Shatner, a move that the show’s executives were supposedly extremely reluctant to make. It’s implied that Shatner and Nichols banded together, did a whole lot of kissing, and made the alternative kiss-free shot unusable. So, history was made. But the most moving moment in Black’s telling might be about how Nichols literally traveled across America to convince people who were not white dudes to join NASA, like Sally Ride and Mae Jemison. Nichols was “the first black lady to go to space for fake, and recruited the first black lady to go to space for real.” I’m not even drunk, and this history is making me cry.